Some people say that they have eyes in the back of their head. That is just a metaphor, but when you wear this Bloody Look Out Beanie, you really will have eyes elsewhere on your head, like the large one on the side of your skull. This sinister example of horror headwear consists of a grey polyester knit beanie hat that, when worn on the head, creates a startling appearance. This hat comes fitted with a latex appliance that makes it look as though part of your hat has torn open, revealing the bloody emergence of a large blue eye on the side of your head. 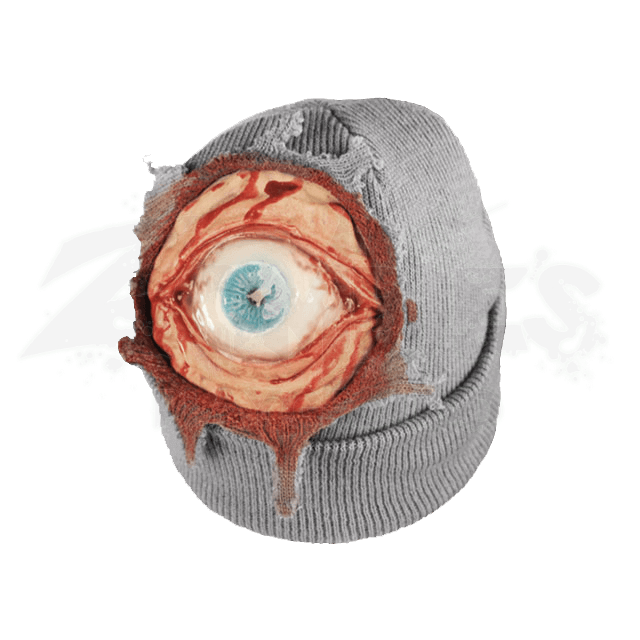 This beanie is fantastic for scaring others and making them feel like something is watching them, especially on Halloween. And of course, you cannot deny that this Bloody Look Out Beanie is a startling accessory that can be used with all manner of other monstrous horror costumes that need an esoteric touch of mutant style.